In early December, Daniel Mason-D’Croz presented at the second annual International Conference on Agro-Industrial Projections hosted by INAI (www.inai.org.ar, www.inai.org.ar/notas.asp?id=193) in Buenos Aires, Argentina. This is the second year that Daniel has presented at the conference and is a part of building collaboration with the economic modeling team at INAI. In 2014, Daniel presented a selection of results from studies considering the effects of adopting new crop technologies (Rosegrant et al 2014, and Robinson et al 2015). In this second conference, Daniel presented a selection of preliminary results from the upcoming IMPACT baseline scenarios and highlighted the new features available in IMPACT 3 (www.ifpri.org/program/impact-model) along with recent improvements and updates to the climate scenarios that now include results across all representative concentration pathways (RCPs) from the IPCC’s 5th assessment report. In addition to the day of presentations discussing agricultural projections, a follow-up modeling meeting was held where representatives from a variety of modeling teams, including OECD-FAO, IFPRI, INAI, and others, discussed the modeling philosophies and ongoing work being done by the different teams. Daniel presented work being done in collaboration with ILRI through the GFSF project to improve the IMPACT livestock module as well as work connecting IMPACT to country land-use models as was done in Colombia (blog post, report). Changing climate is not just affecting agriculture through the direct effects of changing temperatures and precipitation. The ½ degree increase we have already observed is leading to changes in the distribution of plant pests and diseases as new areas have become hospitable to new plagues. These transitions are likely to increase as temperatures increase even more, and they won’t just be limited to plant pests and diseases. Increasing temperatures will likely lead to spreading of tropical diseases (i.e. dengue, malaria, etc.) to higher latitudes in both the northern and southern temperate zones. These changes, among many others, could have many unexpected impacts that would greatly alter the way our global economy and society function. As a part of the International Grains Forum (www.igc.int/en/about/aboutus-pressrelease.aspx, www.igcargentina.com/eng/index.html), Daniel presented a few of these many challenges that face our global food system to help provide context of the nearer term challenges that climate change presents in addition to the longer term challenges that we so often focus on as a part of the Global Futures and Strategic Foresight project. 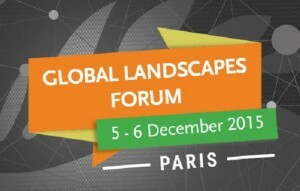 This work was supported by funding from the Bill & Melinda Gates Foundation and the CGIAR Research Programs on Policies, Institutions, and Markets (PIM) and Climate Change, Agriculture and Food Security (CCAFS) to Global Futures and Strategic Foresight Program (GFSF). Aquacul ture is the fastest-growing food production sector globally, with production projected to double within the next 15–20 years. Future growth of aquaculture is essential to providing sustainable supplies of fish in national, regional and global fish food systems; creating jobs; and maintaining fish at affordable levels for resource-poor consumers. To ensure that the anticipated growth of aquaculture remains both economically and ecologically sustainable, we need to better understand the likely patterns of growth, as well as the opportunities and challenges that these trends present. This knowledge will enable us to better prioritize investments that will help ensure the sustainable development of the sector. 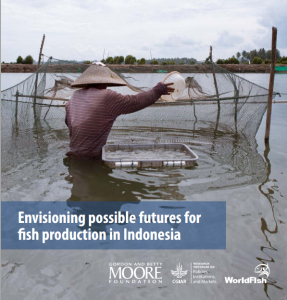 In Indonesia, WorldFish and partners have applied a unique methodology to evaluate growth trajectories for aquaculture under various scenarios, as well as the opportunities and challenges these represent. The analysis indicates that aquaculture will overtake capture fisheries as the major source of fish in Indonesia before 2030 and that investment in aquaculture will be essential in order to increase domestic fish supplies and consumption, maintain affordable fish prices for domestic consumers, and sustain the contribution fish makes to Indonesian food and nutritional security. See more finding on the CGIAR Policies, Institutions and Markets blog here, and read the full report here. 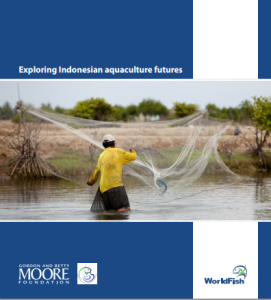 In addition, a related report released by WorldFish summarizes the results of a systematic effort to explore possible futures for aquaculture and fisheries in Indonesia. The work described is part of a larger effort that seeks to develop a shared vision for the sectors that 1) aligns public and private investments to foster growth and economic sustainability; 2) reduces environmental impacts and improves efficiency; 3) increases access by small and medium enterprises to the financial and technical assistance necessary to transition to more sustainable practices. See a summary of the report on the CGIAR Policies, Institutions and Markets blog here, and read the full report here. 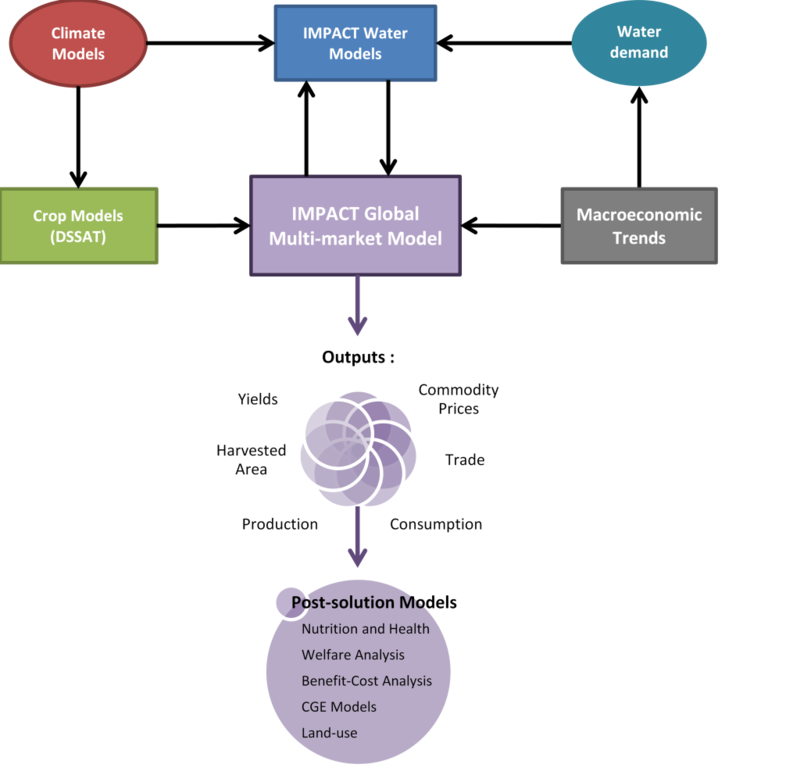 IFPRI’s IMPACT model update: a core component of GFSF’s quantitative foresight modeling. Models can be powerful tools that help us systematically apply data and theory to test our understanding of complex and interconnected systems. A major focus for the Global Futures and Strategic Foresight project is to use IFPRI’s IMPACT model for quantitative foresight modeling to analyze how agricultural and food systems might evolve under alternative futures across multiple dimensions (i.e. population, climate, economic development, among many others). As new data and knowledge become available, quantitative models need to be reviewed and updated to reflect the improved understanding. Continual updating is an integral part of the IMPACT model’s history. 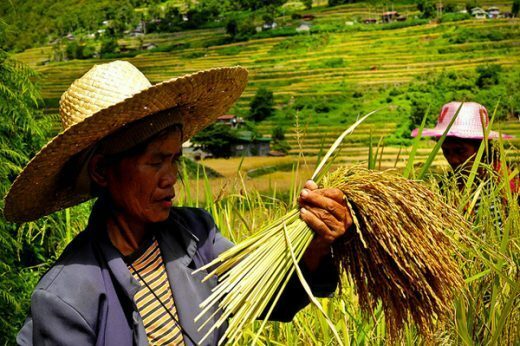 With improved data and computational power, the IMPACT team works to enhance the model’s relevance for policymakers in exploring critical issues around long-term agriculture development and food security. 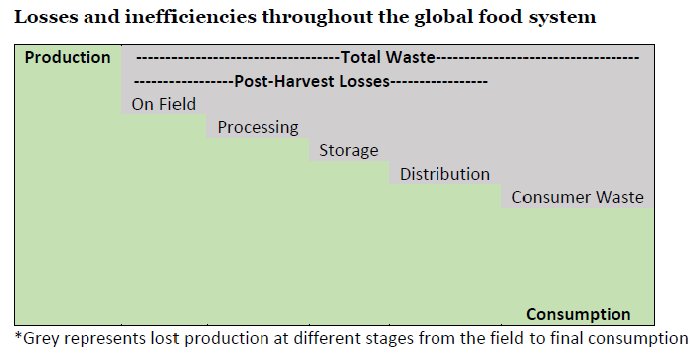 The latest model improvements are just the next chapter in the model’s history, building on the work of previous efforts to simulate the food system in ever greater detail by expanding the number of commodities and individual countries covered by IMPACT. In this latest update, the IMPACT model was designed to incorporate not only better agricultural data but also best practices in model structure and coding. This enables the model to expand to cover new areas of research interest while at the same time ensuring cleaner and modular code. Improvements in model design and structure are explained in detail in the new documentation. Additionally, we go into more detail on the IMPACT modeling philosophy, including discussions on scenario analysis and the role of simulation models in ex-ante analysis. To read the new IMPACT documentation please go to http://www.ifpri.org/publication/international-model-policy-analysis-agricultural-commodities-and-trade-impact-model-0. 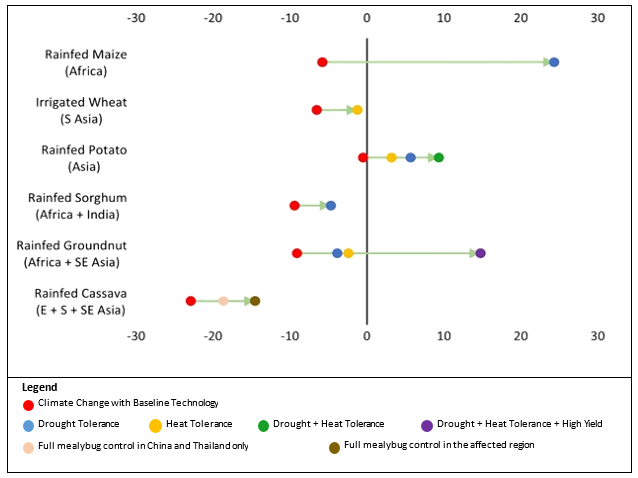 IFPRI, in collaboration with Global Futures and Strategic Foresight (GFSF) team members from CIAT, CIMMYT, CIP, ICRISAT, and IRRI has released a discussion paper titled “Climate Change Adaption in Agriculture: Ex Ante Analysis of Promising and Alternative Crop Technologies using DSSAT and IMPACT”. 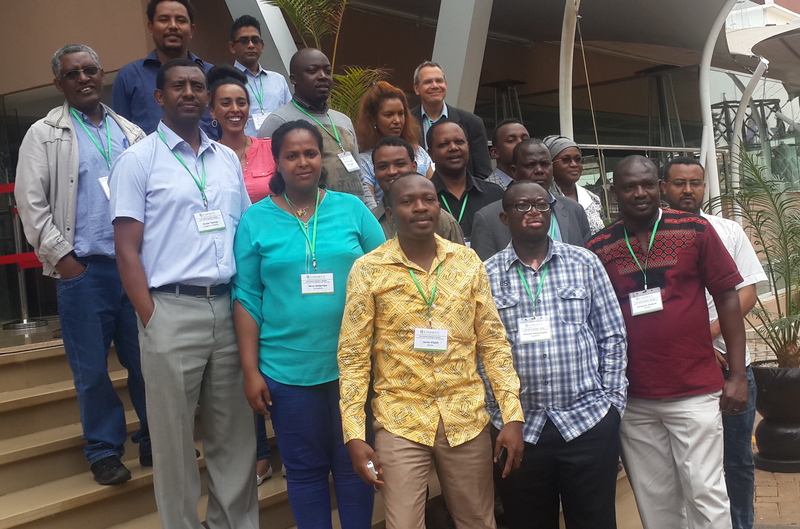 The paper reports results from Phase 1 of the GFSF program in which the participating centers identified promising technologies to model in linked crop and economic models. Drought and heat tolerant traits were modeled for maize, wheat, rice, potatoes, sorghum, and groundnuts, while a promising pest management strategy was tested on cassava. Specific regions and adoption rates were chosen for each of the promising technologies. Achieving food security sustainably is a major challenge that will require continued efforts on increasing agricultural productivity. However, some of the gains in increased productivity may not be realized due to post-harvest losses (losses experienced between the field and the consumer). The International Food Policy Research Institute (IFPRI) and the Korea Rural Economics Institute (KREI) recently signed a Memorandum of Understanding to support collaboration between the two institutions. Collaboration under the MOU will focus on dealing with climate change impacts on regional food and water security in Korea and East Asia, using IFPRI’s International Model for Policy Analysis of Agricultural Commodities and Trade (IMPACT) and related research programs as key building blocks. 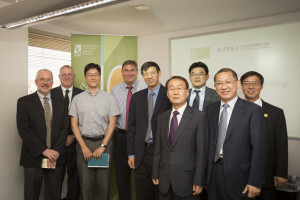 The MOU, covering an initial period of three years, was signed by IFPRI Director-General Shenggen Fan and KREI President Sei-Kyun Choi on July 7, 2015 at IFPRI headquarters in Washington DC.